I do believe the kitchen is the heart of the home which unfortunately makes it prone to chaos, clutter and general disarray. I have two particular bug bears in the kitchen - clutter and shiny things not shining. I love my my gleaming coffee machine so woe betide you if you leave a sticky finger print on its spotless surface. It's difficult to plan what you are going to eat when you can't even see what's in the cupboard. I may not be a Tupperware lady any more but a good cupboard makeover or general kitchen clear out does still make my heart sing. When Fairy asked me to share my kitchen story I knew it had to be about organisation, after all there's a reason "a place for everything and everything in its place" is my mantra. We can talk sparkly surfaces another day, today I'm sharing my favourite tips for organising your kitchen. 1. Keep the cups near the kettle and the washing up paraphernalia under the sink. It sounds obvious but little trips across the kitchen add up and time is precious even in my tiny kitchen space. 2. 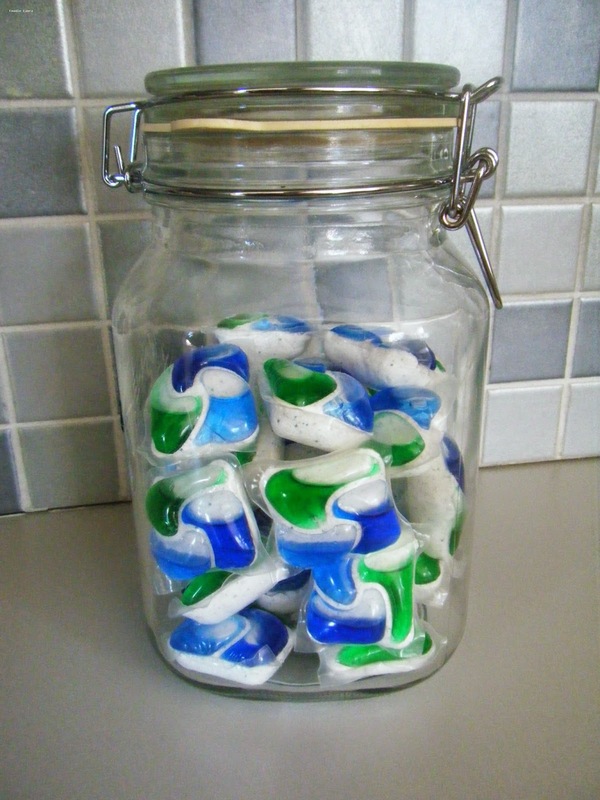 Decant Platinum Fairy dishwasher gels into a secure jar. Splashes of water on them will make them start to dissolve and the bright jewelled colours make the gel packs tempting to little hands. 3. 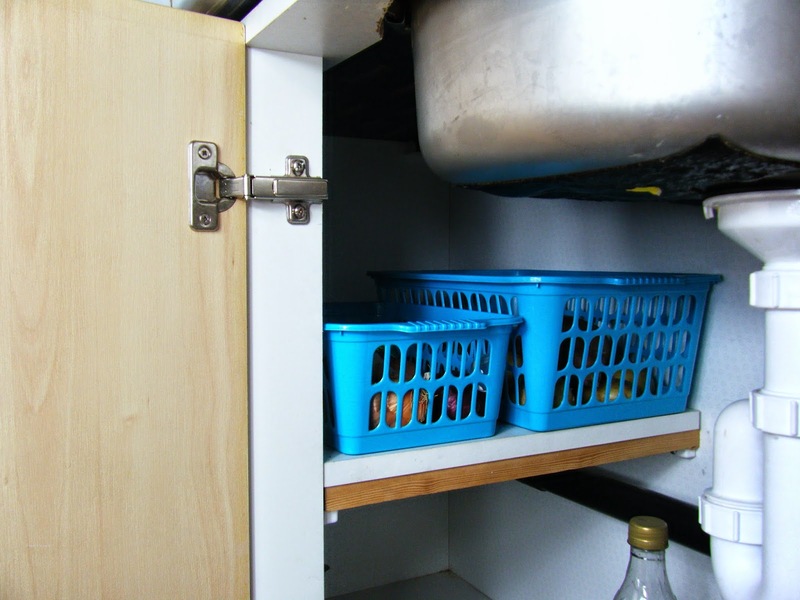 Use baskets in those awkward cupboard spaces. I can pull the basket out when I need something so I don't have to rummage through the back of the cupboard and nothing gets lost or forgotten in that dark unreachable corner either. 4. Tupperware and storage solutions can be expensive, for a quick fix use clothes pegs to secure open bags, old ice cream tubs and take away boxes are great too. My favourite cheap storage trick is clear cottonbud boxes which cost about 40p in Wilkinsons. 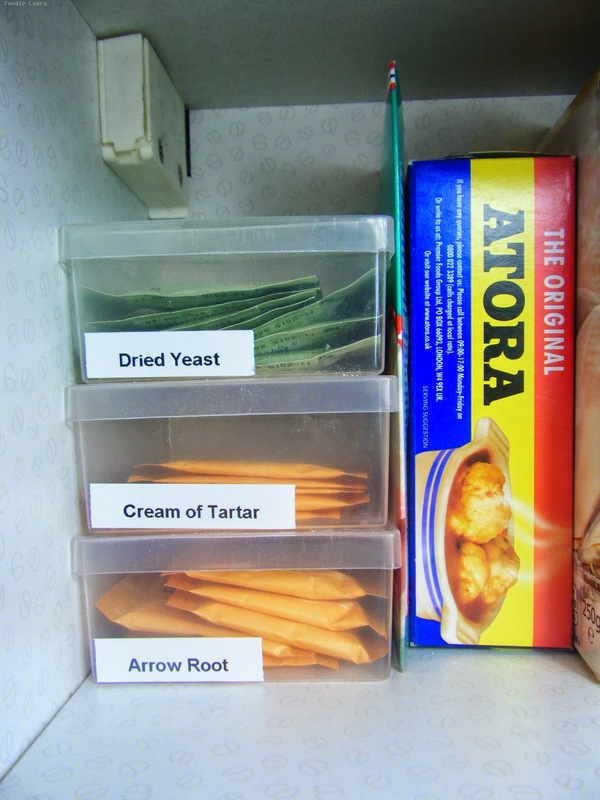 If you do decant something into another container make sure you label it. 5. Keep work tops free of clutter. Nothing spikes my anxiety more than not being able to see the counter top. 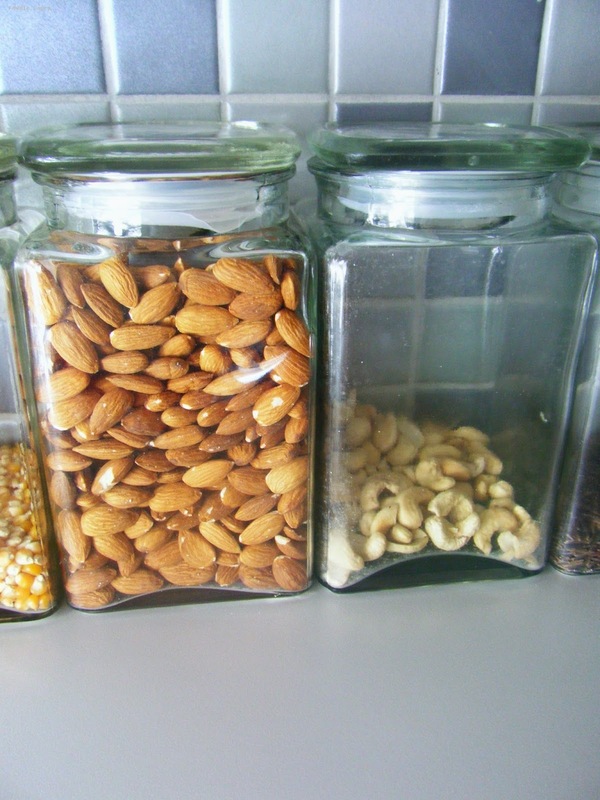 One exception to the no clutter rule is these glass jars of nuts. Leave them out on the side, then they become the first thing you go to when you mindlessly wander into the kitchen to graze. I've been keeping my kitchen organising under wraps but I recently discovered that there is a whole community of kitchen organisers out there and they appreciate the serenity of an alphabetised spice rack as much as I do which made me decide it was time to share.